Quantum chemical study of the nature of interactions between the boraphosphinine and alumaphosphinine with some of the mono- and divalent cations: cation–π or cation–lone pair? Quantum chemical study of the nature of interactions between the boraphosphinine (BP) and alumaphosphinine (AlP) with some of the alkali metal cations (Li+, Na+, K+) and alkaline-earth cations (Be2+, Mg2+, Ca2+) have been investigated at M06-2X/6-311++G(d,p) level of theory. At first, the molecular and electronic structures of the rings (R) and cations (M) were completely analyzed. According to the molecular electrostatic potential (MEP) iso-surface of BP and AlP, the active sites of rings are identified and also predict the relative strength of M···R interactions as follows: Be2+···R > Mg2+···R > Ca2+···R > Li+···R > Na+···R > K+···R. 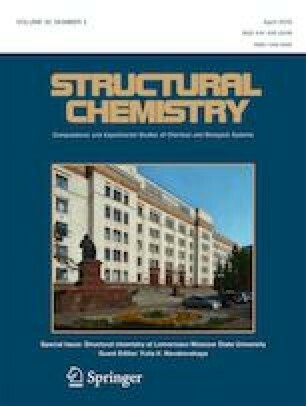 Furthermore, all of the complexes are characterized and their energetic components, geometrical, topological, and molecular orbital descriptors were used to estimate the strength of M···R interactions. The result shows that the non-covalent interactions of M···AlP are significantly stronger than the corresponding M···BP ones. Detail investigation of M···BP and M···AlP series clearly shows a substantial difference in the nature of interactions, cation–π/cation–lone pair (LP) in M···BP/M···AlP complexes. The excellent linear correlations between the energy terms and all of the mentioned descriptors are obtained. Finally, two well-established indices namely the nucleus independent chemical shift (NICS) and the average two-center index (ATI) were used to evaluate the aromaticity of the studied rings before and after complexation.